Tucked away in one of my favorite places in the world -- the jewelry rooms at the Victoria and Albert Museum in London -- is a set of peridot jewels that any August baby would covet. 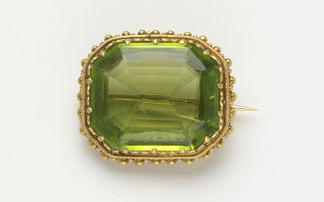 And even better -- these peridot pieces have an intriguing royal connection. Set your time machines, magpies: we're headed for Regency England. One of the most extravagant British royals of all time, George IV (sometimes better known to history as the Prince Regent), also had one of the most disastrous marriages in royal history. His union with Caroline of Brunswick was doomed from the start -- he even barred her from his coronation when he finally became king -- but it did manage to produce a single child: Princess Charlotte of Wales. The Hanoverian royals' family relationships were, to put it mildly, a complete mess -- they distrusted, disliked, and sometimes even openly despised each other. To make sure he knew precisely what was going on in his daughter's life, George recruited two of the ladies from her household, the Cotes sisters, to keep an eye on Charlotte. Charlotte was reportedly not a fan of Charlotte and Lucy Cotes, even calling the sisters and their aunt "the Famine and the consequences," which is a pretty fabulous Regency-era insult. But apparently the Cotes sisters were good and faithful spies, because when Charlotte married Prince Leopold of Saxe-Coburg and Gotha in 1816, George commissioned sets of jewelry for the sisters to wear at the wedding. The suites of jewels -- one amethyst and one peridot -- were made by Rundell, Bridge, and Rundell. 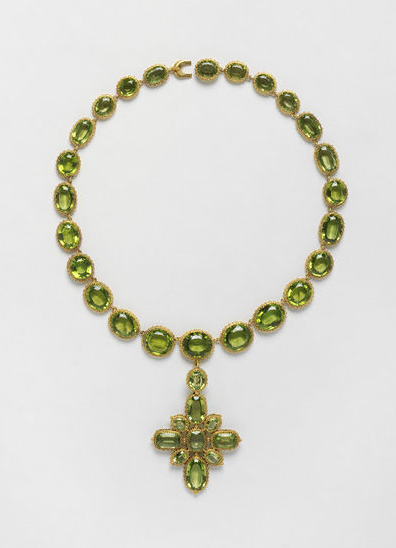 The peridot set is the one on display today at the Victoria and Albert; it consists of a large necklace with a cross pendant, a pair of bracelets, a pair of earrings, and a brooch. 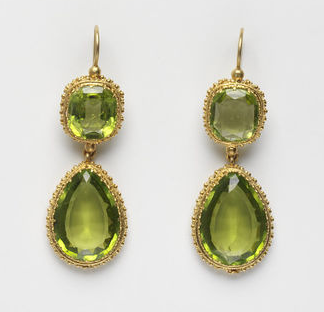 The peridots are set in gold. 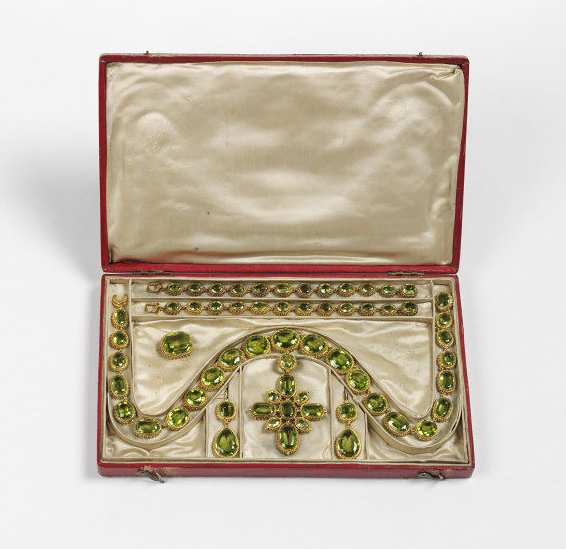 The leather case that the jewels originally resided in still exists, and so does a letter written to one of the Misses Cotes by George's sister, Princess Elizabeth. The handwritten note reads, in part, "I write in great haste by command of The P. Regent to beg you to accept the set of Chrysolytes which I send with this note. He hopes You will wear it at the Wedding as a proof of his regard." (Chrysolite is another term sometimes used for peridot.) The note is signed "Eliza" and dated April 30, 1816. The museum also notes that the invoice for the peridot set still exists in the Royal Archives today. The peridot suite remained with members of the Cotes family for two centuries, but in 2012, the owner sold the set at a charity auction. 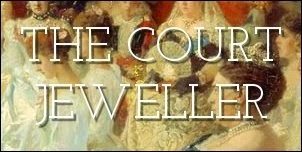 The new owner, however, applied to export the jewels, taking them out of England -- a move that was subsequently deferred by the Culture Minister, Ed Vaizey, in the hopes that a British buyer would come forward and keep the jewels in the UK. And a British buyer did come forward -- the Victoria and Albert Museum, who purchased the set from the person who previously bought the set at auction. Who better to preserve a gorgeous set of early nineteenth-century British jewels with a royal legacy than the V&A? The jewels remain in Britain, and now they're on display (for free!) to the public. If you ask me, that's a win all around.